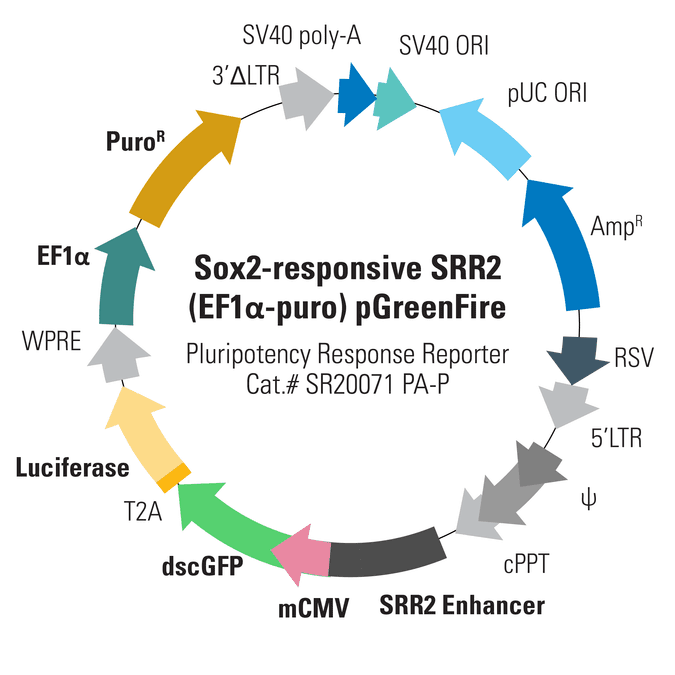 The Sox2-responsive SRR2 (EF1α-puro) pGreenFire Response Reporter uses the Sox2-responsive SRR2 enhancer with a mouse CMV promoter to co-express GFP and luciferase. Co-expression is mediated by a T2 element. The minimal CMV promoter alone delivers negligible expression, but when downstream of SSR2 enhancer elements, drives expression of dscGFP and luciferase in response to Sox2 activity. The result is the ability to quantitatively measure Sox2 activity by fluorescence and luciferase activity. The vector also includes a constitutively-expressed puromycin marker (EF1α promoter) to simplify cell line construction. Or choose a constitutively expressed neomycin marker (Cat.# SR20071-PA-N), or no marker at all (Cat.# SR20071-PA-1).